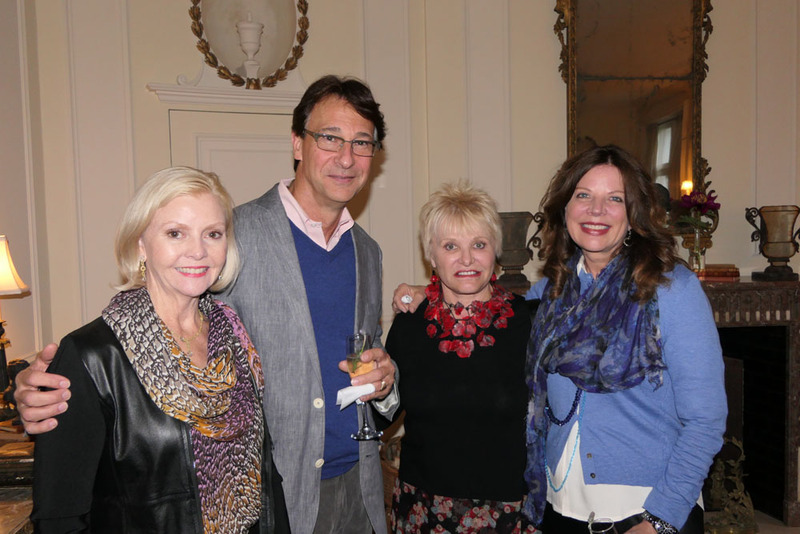 The Fellows trip to Newport, Rhode Island was an extraordinary and inspirational tour of magnificent mansions and gardens, thanks to our amazing Jeanne Anderson who organized the tour. The Fellows were also very fortunate to have the help of noted author and blogger Bettie Bearden Pardee, a resident of Newport, who graciously arranged many of the exclusive private home and garden visits that were truly spectacular. John Tschirch, an award-winning architectural historian, was our excellent guide throughout the tour. Our first evening was spent at the Redwood Library with a lecture by Rockwell Stensrud. The Redwood Library is the oldest lending library in America, and the oldest library building in continuous use in the country. Founded in 1747 by forty-six proprietors upon the principle of “having nothing in view but the good of mankind,” its mission continues over 250 years later. Rockwell’s book Newport: A Lively Experiment 1639-1969, is a fascinating book on Colonial America and the history of Newport, detailing its ups and downs from its founding in 1639 until today. One of the private houses visited on the tour was The Whim, the Newport cottage of Oatsie Charles, formerly the caretaker’s cottage of the estate Land’s End, Edith Wharton’s home. Mrs. Charles had originally lived in Land’s End, but she moved to the cottage after her husband’s death. Mrs. Charles renovated The Whim before she moved in, turning it into what she called “an elegant jewel box.” In The Whim, she placed her large collection of furniture and rare artwork, which included the antique paneling that she purchased from the auctioning of nearby Marble House. She made her biggest renovations on the grounds, which she turned into magnificent gardens. Oatsie enjoys walking through her topiary wonderland. Another exceptional home was Bellevue House, home of Ronald Lee Fleming. Behind its prim facade, the house conceals grand and classically proportioned interiors, including a sky-lighted rotunda famous to historians of the decorative arts. For two years, Mr. Fleming concentrated on reconstruction efforts, replacing — among other things — the crumbling rotunda dome, the rotting balustrade on the roof and much of the brick wall surrounding the three and a half acres. Mr. Fleming purchased Bellevue in 1999, which was in disrepair, but with an enticing social history. We were invited to explore the walled grounds, containing specimen trees, an orchard and pergola, and a restored Art Deco fountain. The French garden, with topiary and pollarded trees, was the work of Achille Duchêne, who also worked on the restoration of Versailles. Mr. Fleming is recognized for planning, public art, and urban design projects seeking to merge the skills of architects, historians and artists. He is an alumnus of Pomona College and Harvard University’s Graduate School of Design, and is currently an active board member of Scenic America, and Trustee of the Preservation Society for Newport County. The Massachusetts Historical Society nominated Mr. Fleming’s early trilogy, The Power of Place, for a Pulitzer Prize in 1982. We are very excited that Mr. Fleming will be speaking to the Fellows on one of his upcoming visits to his home state, California! Touring Sakonnet Garden in Little Compton was our day in the country! The Cardigan Welsh Corgis, Lucky and Lewis, greeted us as we entered Sakonnet, a secret garden embedded within a native coastal fields landscape. It was like entering a living piece of art. At the diminutive scale of a cottage garden, it is conceived as an intimate place to explore, with multiple paths leading one onward to unexpected experiences. Sakonnet began in the mid 1970’s as a small clearing deep within a natural tangle of Autumn Olives, Oriental Bittersweet and local Arrowwood Viburnums. Now larger than an acre, its labyrinth of spaces are carved organically out of the original thicket. Each outdoor room reflects the owner’s ongoing experiments with lighting, space, and color mixing, collecting and growing wonderful plants. Sakonnet is a long-term project of John Gwynne (JAG) and Mikel Folcarelli (MF), abetted by Addie Kurz (energetic sister) and Ed Bowen of nearby Opus Nursery. All are Rhode Islanders, with John, trained as a landscape architect and involved with global conservation education and local meadow restoration and Mikel, a store design and brand identity consultant. This is a personal and quixotic test garden. Thousands of rarely grown plants have been planted, moved, coddled or weeded out in the last 35 years. Blithewold in Bristol was another property we visited that day. We toured a home with many similarities to Virginia Robinson Gardens in the town of Bristol. The curator Margaret Whitehead gave us a special tour of their archives and collections which included several family letters written during the Civil War and clothing from the turn of the century, meticulously preserved. Blithewold, a 33-acre summer estate with grand views of Narragansett Bay, is nationally significant in American history as one of the most fully developed and authentic examples of the Country Place Era. The property features a 45-room mansion filled with family heirlooms, and is framed by a series of lovely gardens that range in character from mysterious to exotic and from poetic to practical. An exceptional collection of rare and unusual plants, specimen trees, an accessible greenhouse, and whimsical stonework project a character that is romantic, fresh, and inspiring – and unique to Blithewold. We had the rare opportunity to be able to visit the recently restored Blue Garden. Sarah Vance, Director of the Blue Garden, welcomed us and shared a film on the history of the Blue Garden and its recent restoration. The original garden room was shaped to classical proportions by Frederick Law Olmstead Jr. and enlivened by an unusual horticultural palette requested by Mrs. James — “a monochromatic concentration of purples and blues.” Hidden behind a dense border of trees and shrubs, it was a secret garden, a hortus conclusus (a Latin term meaning literally “enclosed garden.”) From its opening celebratory spectacle, “The Masque of the Blue Garden” in August 1913, events in this garden were covered in detail by newspapers and periodicals across the country. It was Dorrance Hamilton whose commitment to recapturing the notable component of both Newport’s and the nation’s cultural history that the retrieval of the Blue Garden was made possible. With her sound preservation instincts and love of gardens, Dorrance recognized the potential for enjoyment and education that this unique landscape from Newport’s past could bring to future generations. The 2014 plan utilizes fewer plant species grouped into the patterns of the original beds. A new model for plant selection was developed where dependability, drought tolerance, ease of maintenance, and longevity of bloom were factors of equal importance to the monochromatic hues and the interplay of textures. Among the public historic gardens visited was The Elms (1901), a stately Gilded Age estate inspired by an 18th century French chateau and surrounded by formal terraced gardens and a park of fine specimen trees. In 1961, the site was threatened with demolition but saved by the Preservation Society of Newport County. Our guide John Tschirch served as the historic advisor for the restoration of the Sunken Garden in 2001. He gave us an illuminating tour of every room including the servants’ quarters- very Downton Abbey! The magnificent garden with weeping beech trees, hinoki cypress, Italian fountains, French parterre and marble pavilions is a time capsule of opulent Classical Revival design. Today, The Elms is designated a National Historic Landmark. Another amazing estate was Rough Point, Doris Duke’s home. One of the several remaining Gilded Age heiresses in Newport, Doris was a lifelong preservationist and devoted much of her fortune to restoring colonial buildings in the city where she spent her summers. She founded the Newport Restoration Foundation in 1968 with the purpose of preserving Newport’s 18th and 19th-century heritage. Her extraordinary vision resulted in an almost single-handed rescue of Newport’s early architectural heritage. As a collector, Duke spent much of her time traveling the world, amassing countless treasures and notable collections of Islamic and Southeast Asian art. She also traveled throughout Europe building her collection of fine art and furniture, much of which she used to furnish Rough Point. Home to Doris for decades, Rough Point is different from most of Newport’s other mansions which when toured, appear austere and museum-like. The house maintains a clever mixture of grandeur and hominess that others lack. While the drapes on her bed were bought at JC Penney, the home is filled with priceless antiques — French furniture, European Art, Chinese porcelains and Flemish tapestries. Paintings in the home include Gainsborough, Van Dyck, and Renoir. When she died in 1993, she left her home, intact as she lived in it, to the Newport Restoration Foundation to be opened as a museum. The Fellows dined in amazing restaurants that were former historic homes. The New York Yacht club was the home of the Brown family that founded Brown University while Chanler on Cliff Walk was built by a New York congressman and the Clarke Cooke House was the home of a sea captain in the 1700’s. The Fellows also enjoyed a delicious dinner at Bettie’s beautifully decorated home and garden. Her blog, Private Newport with Bettie Bearden Pardee is just gorgeous! She mentions the dinner and the “lovely ladies of the Virginia Robinson Gardens” in her blog post entitled Wit and Whimsy in the Garden. In brief, the Fellows trip to Newport was sumptuous and rich with history, elegance, and culture, reflecting the era of the Gilded Age. It was glorious and enchanting, thanks to Jeanne’s hard work and friendship with Bettie, who provided the rare opportunity to visit and enjoy the private estates. The extraordinary level and quality of this tour is one more reason to upgrade to the Fellows level, if you haven’t already done so! We can’t thank you enough, Jeanne for endlessly enriching our lives! Bettie’s own home, “Parterre,” with its often toured garden is also featured in the Garden Club of America’s coffee table book, Gardens, Private and Personal; the frontispiece of the book highlights an elaborate bench of her own design. Bettie’s garden inspired her love of flowers and design, leading to her position as an award-winning flower arranger and Garden Club of America judge. She chaired the Newport Flower Show for 8 years and was the Garden Club of America Zone II chairman for Garden History and Design. Currently, she is the Visiting Gardens co-chair for her Club, the Newport Garden Club. A contributing editor to Bon Appetit for eleven years, producing “Entertaining with Style,” Bettie was also host/producer of the PBS series “The Presidential Palate: Entertaining at the White House.” She is a recent president of the Newport Garden Club and is currently Chair of the Gardens and Landscape committee of the Preservation Society of Newport County. Her civic and charitable support includes the Aquidneck Island Land Trust, the Boys and Girls Club of Newport County, the Redwood Library and Athenaeum, the Newport Architectural Forum and the Hope Funds for Cancer Research. Bettie and her husband, Jonathan, reside year ‘round in Newport.